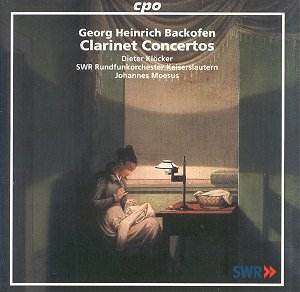 Backofen is certainly an obscure figure to most music-lovers. He was born in Durlach, Germany and aside from taking to his musical studies like a duck to water also proved a talented draughtsman and a gifted linguist. Influenced by the Paris-based 19th century clarinet master Xavier Lef�vre he wrote a number of works for clarinet. Works for harp also feature in his catalogue. He was recognised in the Gotha orchestra as an outstanding player of clarinet, basset-horn and harp. After Gotha his final move was to the Darmstadt orchestra as part of the Court of Hesse. Ever the astute entrepreneur he there established a wind instrument factory. The language of these three concertos is strikingly Mozartian at times (e.g. Jupiter Symphony in the first and last movements of opp. 3 and 16). All the usual delightful clarinet virtues appear in the golden middle movement of Op. 3, the finale of which holds a few surprises. These include some almost Greek folksy trills, bubbles and other endearments. The solo part of Op. 16 suggests a cheeky Neapolitan street singer. Some of the more animated writing looks forward to Rossini's overtures ... and there is something of a facial resemblance too. Op. 24 is ushered in by Beethovenian funereal writing before Backofen's accustomed bel canto nonchalance steps up to the line disarming and without a care in the world. The Andante is in this one case rather more perfunctory than the earlier middle movements. Kl�cker is a graceful guide and a luminous-toned exponent. His orchestra is the SWR Rundfunkorchester Kaiserslauten which is stylishly conducted by Johannes Moesus. This is by no means a luxury band and a certain thinness can sometimes be noted.� That said, attention quite naturally fixes on the solo and there is plenty there to distract and beguile. Masterworks? Well, no but they are eminently entertaining and touching and administer a few surprises along the way.